Social hour 5 p.m. — Dinner 6 p.m. — Program 7 p.m. Please join us as at the Greek Community Center, 129 S. Union St., Akron, Ohio 44304. Our guest speaker is balloonist and author of The Wreck of the Naval Airship USS Shenandoah, Jerry Copas. Jerry is an airship enthusiast and balloon pilot from Sellersburg, Indiana. He is historian of the Balloon Society of Kentucky and a member of the Balloon Federation of America, Navy Lakehurst Historical Society, the Naval Airship Association, and The Lighter-Than-Air Society. Copies of his book about the USS Shenandoah will be available. The program also includes presentation of the Ren Brown Lifetime Achievement Award and a display of airship artifacts – and guests are invited to share items from their collections, too. The banquet will also feature a silent auction, with items including a certificate for a flight for two (2), on a Goodyear blimp. This certificate has been donated by The Goodyear Tire and Rubber Company. Reservations are required no later than Sept. 21, 2018. Cost is $35 per person. Menu entrée options are beef shish-ka-bob, boneless breast of chicken Cordon Bleu or vegetarian platter. Click here to see the registration form. Print it out, fill in your selections and mail it to address on the form with your check, or email it to ltasohio@gmail.com and pay online via PayPal using the “Donate” button on the right side of the page. 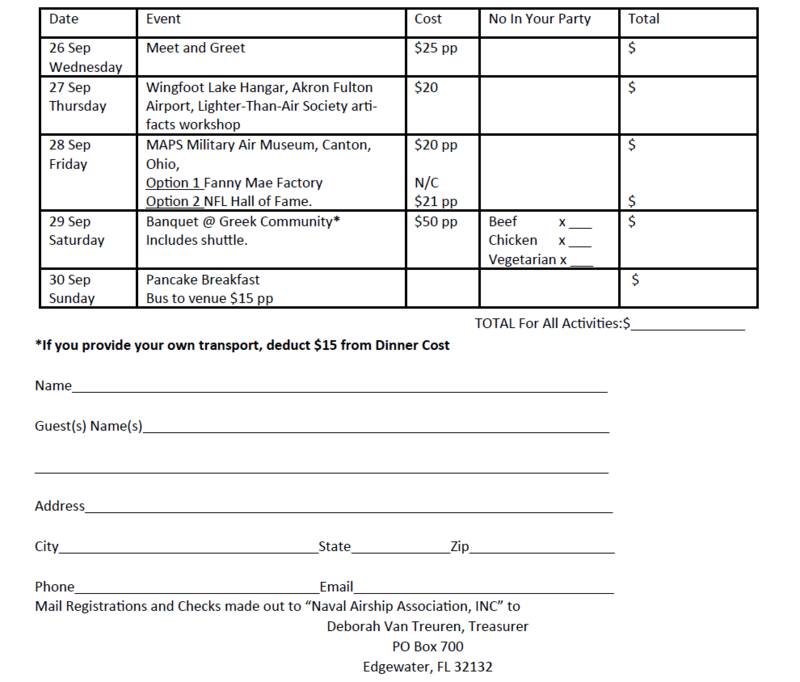 This year’s Banquet will be held in conjunction with the 2018 NAVAL AIRSHIP ASSOCIATION REUNION and CONFERENCE. Receive ID Badge, NAA Lanyard and welcome bag and gifts. Cash bar and selection of hot and cold hors d’oeuvres $25 per person. Travel by Coach to Wingfoot Lake, site of one of the Navy’s first Naval Air Stations and visit Goodyear’s largest airship facilities where the last three Zeppelin NTs were assembled. We will observe the newest Goodyear NT airship, (now called a “blimp NT” by the company) Wingfoot 3 and perhaps another NT which might also be in the area. From Wingfoot Lake travel to the Akron Fulton Airport for a special “behind the scenes” guided tour given by a life-long airport area resident and current FBO employee Mr. Jim McGuire. Lunch Stop near Wingfoot Lake. Lunch cost not included. We will conclude our day’s visit to Akron with a visit to the Lighter-Than-Air Society workshop in downtown Akron. MAPS Military Air Museum, Canton, Ohio, with options to visit Fanny Mae Candy Factory or NFL Hall of Fame. Saturday at 9:00 AM we will conduct our Association’s General Business Meeting at our hotel. We will offer additional Akron-area tour side trips (locations of tours will be posted at time of registrations) and sign ups and options will be facilitated at registration table. Joint Banquet will be hosted at the Greek Community, 129 Union Street (now incorporated in the University of Akron campus in downtown Akron). Our program will run as follows: 4:30 Shuttles depart for Banquet site. 5:00 pm Social Hour. Bidding opens for Silent Auction, Displays by LTAS and private collectors will be available for viewing. 6:00 pm Dinner.7:00 pm Silent Auction bidding closes. Formal program begins. The year in review. Awards, recognition of Theresa and the late Brian Rayner who created and curated a fascinating museum of history and artifacts of the USS Shenandoah ZR-1 virtually at the site of where the U. S. Navy’s first rigid airship came to a final rest. 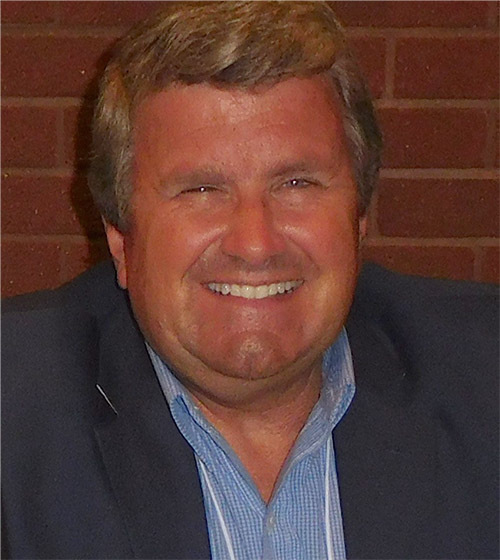 Our featured speaker for the evening will be Mr. Jerry Copas who will talk about his recent book, the Wreck of the Naval Airship USS Shenandoah, giving his unique perspective as a balloon pilot who has flown in the Noble County area where the airship crashed. Jerry will be selling and autographing copies of his book at the banquet. 8:30 pm Silent Auction results announced and checkout of purchases begin. Choose from three dinner choices: Chicken, Beef or Vegetarian selection. Great deserts included. The price includes shuttle service to and from the Greek Community downtown. Beer and wine by the glass are available at $3.00 each. Tickets for beer and wine will be sold at the Banquet sign-in table. As an option we can attend a pancake breakfast at the Maps Museum at the Akron-Canton Airport. Breakfast runs from 8:00 am until 1:00 pm. We will operate a shuttle bus for $15.00 round trip from and to hotel. We can also take you to the airline terminals. Sign up at registration desk. This entry was posted in Annual Banquet, Events and tagged Annual Banquet, Goodyear Blimp Flight, Silent Auction. Bookmark the permalink.